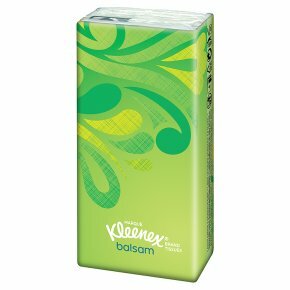 Kleenex® Balsam Tissues are the first to leave behind a micro-fine layer of calendula, a balm which soothes the nose and helps prevent it from becoming sore and red - ideal for when you have a cold. Dermatologically tested and leaves behind a micro-fine layer of soothing calendula. Soothes and protects the nose. They are available in single and twin packs, mansize compact packs and handy pocket packs for on the go. Contains 1 pack of 9 tissues.